There is a void in my heart that was ignited by Wild Flag’s excellent album and continued by my subsequent deep dive into Sleater-Kinney and Bikini Kill. 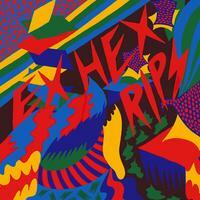 Ex Hex is filling the void with their debut album, Rips. Ex Hex is fronted by Mary Timony (formally of Helium, Autoclave and Wild Flag) and features Laura Harris and Betsy Wright. On their site, they describe the band’s sound as “Ex Hex is what your older brother’s friends listened to.” That is the apt description. The idea of being hip is addressed in “War Paint.” Timony brightly sings,“But there’s still one thing that never goes away/ You think you’re too cool/So put your war paint on/ and dance alone in the crowd/ and soon you will discover the music was just too loud.” This is a great way of expressing the distress with growing older. You can’t be young forever. One day you’ll start wearing earplugs to concerts and complaining about late-start times. Weezer released two of my favorite albums of the past 20 years, Blue Album and Pinkerton. 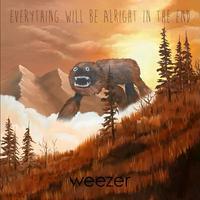 While I know new Weezer material will never live up to the old stuff, the release of the new album, Everything Will Be Alright in the End, prompted me to think about Weezer and their audience. I asked myself whether or not any those Blue/Pinkerton-era fans like the new material. And my conclusion is they probably don’t. I think these newer Weezer albums are a sort of “reboot.” Weezer is presenting themselves to a new generation of fans. Many of the songs on this new album are appealing. There is that snarky feel to the lyrics and the melodies are infectious. However, the themes of the album are rooted in displeasure with modern culture and a resentment of foreign concepts. This Weezer album is quite “get off my lawn” but it seems geared towards those lawn-dwellers. It is what it is. I think I’ll go back to listening to Pinkerton now.